If you’re fortunate in your wine life, there comes a time when the stars align and bless you with an “ah ha” moment. It happens when you actually taste and experience what you have read about. You taste, for example, a Dolcetto d’Alba and a Dolcetto d’Asti from the same producer and from the same vintage. Just tasting Dolcetto from different producers and different vintages … sure that’s fun. But it won’t produce the “ah ha” understanding that comes with tasting terroir. 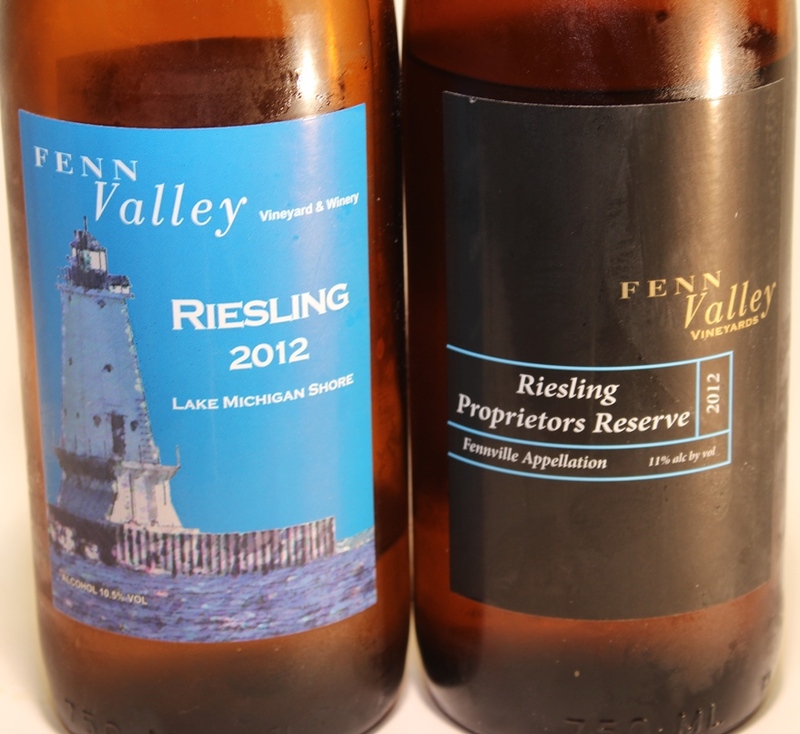 Recently, I tasted two Rieslings from Fenn Valley’s (Vineyard and Winery) 2012 vintage. The winery is located within the Lake Michigan Shore AVA (American Viticultural Area – think DOCG, AOC and such). 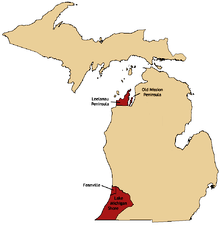 The Lake Michigan Shore AVA is in southeast Michigan and the oldest commercial grape region in the state. Vineyards in the region date back to 1867. Fenn Valley is within the smaller, sub-AVA of “Fennville” and a great location to grow Riesling grapes. This became evident tasting the two Rieslings. Being an old sort, I matured on Rieslings from the Mosel region in Germany. Over time, this style became my benchmark against which all Rieslings were judged. Germany is so serious about Riesling that it regulates its labeling based on, among other things, the grapes’ ripeness. Once you understand the system, you know if the wine you’re looking at is dry (Kabinett) or lusciously Sauterne-sweet (Trockenbeerenauslese). There are several levels in between. Tasting Fenn Valley’s Riesling (blue label), I was struck by its character. 100% Riesling with the characteristics of a classic Mosel and approaching the sweetness of a Spatlese. Identified by the winery as “semi-dry,” the wine offers a strong and pleasing aroma of citrus. In the mouth, it offers flavor notes of sweet peach balanced against tart apple. The wine is well rounded and finishes crisply while leaving you still appreciating the sweet-tart interplay of sweet peach against tart apple and wanting another sip. The “Proprietor’s Reserve” (black label) is less sweet; mid-point between dry and semi-dry per the bottle’s back label (see “Tech Specs” below). The nose offers less citrus but is more floral. The flavor was (to me) more complex with hints of lemon grass and vanilla bean. In the mouth, the wine was weightier and, like the standard Riesling, was well rounded and finished clean. I had another sip. In the glass “Proprietor’s Reserve” is a shade deeper gold. From the color, you would expect the wine to be sweeter than the standard Riesling, though it’s not. And what accounted for the “Reserve’s” complexity? Here we get into labeling again. The term “Reserve” has no legal definition in the United States. It does not mean the wine has been aged longer, or that the grapes were hand selected and only the best used. From my experience, while it has no legally defined meaning, it can be taken to mean “special.” Without exception, every winemaker I’ve met carries on a love affair with wine, is proud of their craft and honest about the results. So what makes it special? I kept pestering the winery. Were different yeasts used? Were the grapes from different vineyards? Fermentation different … yadda, yadda? The answer was in the vineyard. Grapes for the “Reserve” came from a particular farm in Fennville (they have several). I like Fenn Valley’s use of the word “farm”. Grapes are a crop after all. Drive through the Midwest and there are many farms on which people raise families that are close to the earth and understand soil and weather. Brian Lesperance, Marketing Manager, explained that grapes from this one location were kissed by botrytis (full name botrytis cinerea, a beneficial mold that shrivels the grapes, concentrates their sugar and flavors while maintaining their acid). While you may think that this guarantees a syrupy wine better suited for pancakes, look again at the tech specs for this wine. Botrytis is risky in that the vineyard takes a risk that botrytis (a natural process) will actually develop. Conditions must be perfect. If it does not, if conditions are not just right, the grapes will be unusable. Even when it is a “feast” year in this feast or famine game, the amount of useable fruit is greatly reduced. Conditions at this particular farm were perfect in 2012 and produced a wine of balance, lovely mouthfeel and complexity. Fenn Valley Vineyards produces a reserve only when those conditions present themselves and indeed those conditions must have been all wrapped and tied in a bow as presented. Unlike other botrytized wines I’ve tasted, the Fenn Valley’s Reserve Riesling reflects grapes picked at the perfect time (for me): complexity without taste-clouding sweetness. If you’re waiting for me to tell you which wine I preferred, you’ll be disappointed. I was not disappointed in either of these wines, and – really – that’s the point. Seldom does an opportunity come along in which one can taste side by side two wines of the same grape and vintage from the same winery and enjoy the “ah ha” moment that comes with tasting terroir. And speaking of opportunity, each of these wines was available at only $12, a price far below how they taste. Follow Wine Mizer on Face Book for mini reviews, fun facts, recipes and more.